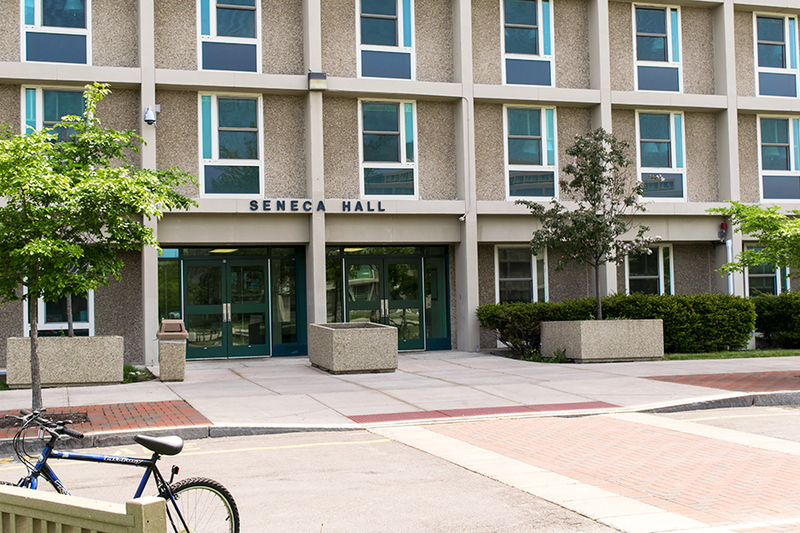 Opened in 1967, Seneca Hall was the first high rise residence hall to open on “New Campus,” now referred to as “West Campus.” The third high rise dormitory to open at SUNY Oswego, it is a coed dorm that houses 600 students between 10 floors, making it one of the the largest on campus. Seneca Hall was named in honor of the Seneca Nation, the westernmost of the five nations of the Iroquois Confederacy. In their native language, the Seneca refer to themselves a O-non-dowa-gah (Oh-n'own-dough-wahgah), which translates to "Great Hill People." The Seneca are the largest nation in the Iroquois Confederacy, with more than 8,000 people identifying as members of the Seneca Nation.